Speaking at a recent internal "town hall" event, Apple CEO Tim Cook hinted that services beyond Apple Music might soon make the leap to additional platforms, like Android. The Apple Music Android app is currently testing the prospect of growing services through new platforms, 9to5Mac reported, citing sources who heard Cook at the gathering. One of the main goals of the app was initially to avoid losing subscribers to Beats Music, which Apple Music is based on. Apple acquired Beats for $3 billion in 2014, and began transitioning customers shortly after Apple Music was launched in June 2015. Android support also maximizes potential listenership, in light of the platform being more widespread than iOS. 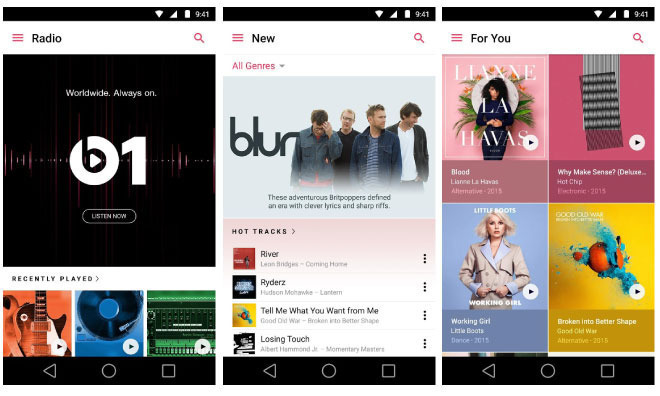 Apple could conceivably bring iTunes music, book, and/or video sales to Android, along with its rumored streaming TV offering. Cook separately commented on the decline of the iPad, insisting that the product should return to revenue growth by the end of 2016. Sales have been on the decline for several quarters, driven by factors like the growing popularity of "phablets" like the iPhone 6s Plus, and slower upgrade cycles when compared with smartphones. A third-generation iPad Air is expected to debut this spring, which could help reinvigorate sales with iPad Pro-like features including a Smart Connector and stereo speakers. Cook addressed a number of other topics as well, noting that the first workers should be moving into Campus 2 by the end of January 2017. Apple employees are now also eligible for up to four weeks of paid leave if they need to take care of sick relatives, and the company's improved maternity and paternity benefits should be available in most countries outside the U.S.
COO Jeff Williams added that the company will soon announce that all of the smelted metals Apple uses are either conflict-free, or from partners presently being validated for conflict-free status.